I didn’t have the heart to deny Super Bear’s request. He’s only just been placed under my care and his eyes were so imploring when he asked to come along that I just couldn’t say no. Besides, I figured that if Paddington Bear successfully journeyed from deepest darkest Peru to London, England, then Super Bear could certainly make the journey from snowiest coldest Canada to Africa. And so, I’ve agreed to bring him along. The truth is that Super Bear’s name is simply “Bear”. But the solitary and nondescript “Bear” was just too ambiguous and I couldn’t resolve the puzzle of whether “Bear” was his first or last name. Accordingly, I’ve bestowed upon him the moniker “Super Bear”. 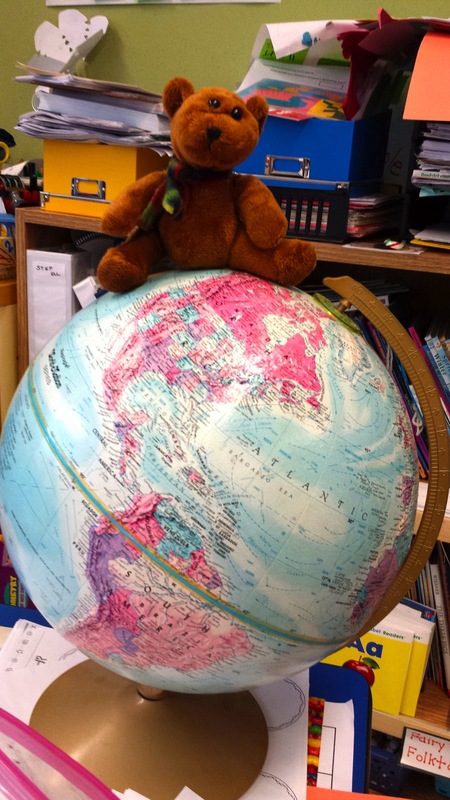 Super Bear came from the home of Nietzsche‘s friend Zarathustra but he’s since taken up residence in Ms. Dallner’s Grade 1 classroom at University Heights Public School in London, Ontario. I have a lot of questions for Super Bear, my cuddly little Ubermensch. He has disproportionately lofty goals about many things, including how to bridge the Digital Divide in Africa. Bridging seems like an appropriate metaphor to associate with the Digital Divide. In the digital sense, the world wide web represents a kind of other-worldly virtual cyber-bridge using a system of hyperlinks as bridges to create an entry into web pages – each link crossing into a new world and reality on its own. It communicates the ability to connect and disconnect as well as an openness to two opposite sites or directions. Thus, as we understand this metaphor, we understand the need to transport an educational solution while retaining two separate educational contexts. Super Bear and I have a number of letters to deliver from the grade 1 class in London, Ontario to the grade 1 class in the village of Katuba, Zambia. I wonder if these old-fashioned letters will also act as a bridge? Can they also serve as a link crossing into a new world on their own? I’m eager to find out. I guess this means that Super Bear and I will serve as hyperlinks. But instead of existing in a virtual world, we will be invading time and space for the purpose of physically pointing to letters from the Kingdom of Far Far Away. Katuba village is a very poor rural community. It is located 30 km outside the town of Kabwe and has a population of approximately 500 people. Most of the villagers rely on subsistence farming which is very difficult because farming inputs such as seeds and fertilizer are difficult to acquire. Education is an ongoing challenge for Katuba. The closest government school is 17 km away and hence, most children do not attend. As a result the people of Katuba took what little resources they had and used them to construct their own school and provided untrained volunteer teachers to work with the children. digital. And so here I stand, guilty as charged, for allowing my own Western-based and technologically savvy mindset to attribute the educational ills of our planet’s poorest countries to mere digital access. Clearly, this very real “divide” requires a more holistic solution. A solution requiring people and infrastructure and transportation. Some Broadband would help too.